So anyone who knows me or possibly follows me on Instagram, knows that our family car is HUGE to me. We currently have a 2011 Dodge Charger and I love her but I seriously feel like I’m driving a rocket ship everyday. 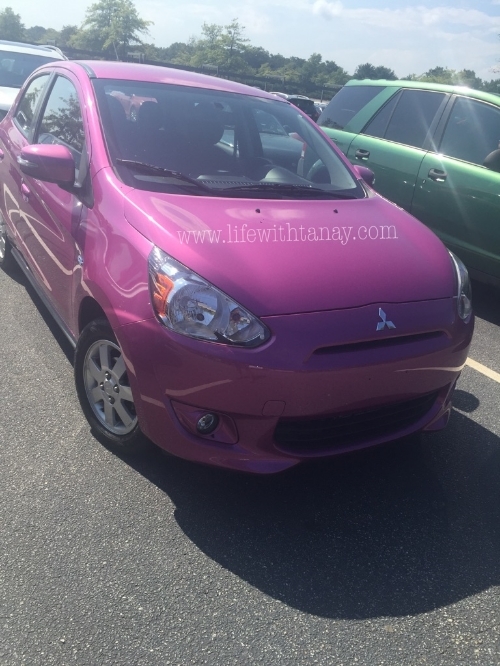 When the beautiful people at Drive Shop gave me the opportunity to test drive the Mirage (in plasma purple… I love me some purple) , a subcompact car, I jumped on it! I loved the week that I got to spend with this cutie and I was super sad when they came to pick her up! My original plans for the Mirage were to road trip it to PA for our family barbecue over Labor Day weekend, but I am a serious over-packer when it comes to RJ and we had some unexpected additional travelers. The trunk space in the Mirage was JUST big enough for RJ’s stroller and it didn’t leave much room for the luggage of 4 people, but during the whole time I had it, that was the only con I could come up with. For a subcompact car, the inside of the Mirage is super spacious. Boyfriend is 6’1 and he was able to fit comfortably as well as the car seat (equipped with LATCH, cause that’s important for us mommies) in the backseat, with plenty of space for 2 other people. I was a little nervous about her being able to handle the streets in NYC (notorious for potholes) but she handled them like a champ. With a starting price point of $12,995 the Mirage is super affordable and on top of that gets 40 mpg combined! If you’re looking for a cute, affordable car the Mirage has everything you could ask for. And other than plasma purple it comes in other super fun colors! Rewind to three years back and younger, cute, childless me, would’ve loved to be driving the mirage around the city!